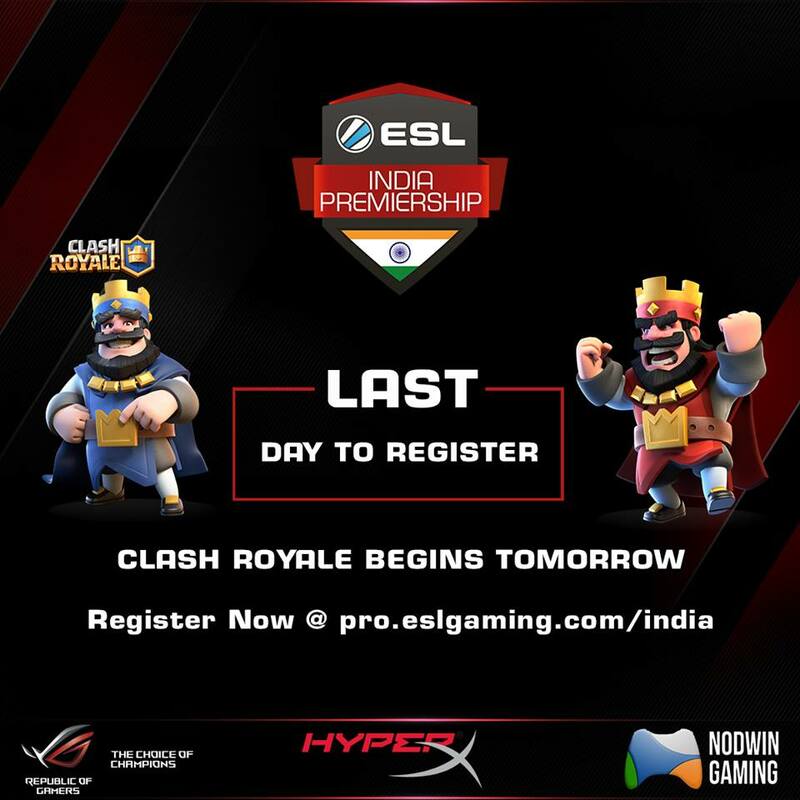 ESL India Premiership welcomes Clash Royale Challengers! ESL India Premiership started its journey back in May and has completed 3 Starter Cups and 1 Challenger so far. With the Starter Cup 4 running from 5th August, the team at ESL India and Nodwin Gaming is glad to bring in Clash Royale. Registrations for Clash Royale Starter Cup 4 ends today and matches will begin tomorrow onward. Earlier in the first 3 Starter Cups, Clash Royale’s slot was occupied by Hearthstone. The response for Hearthstone was very poor which led to its replacement. When asked “Why did you pick Clash Royale out of many others?”, Gautam Virk, Director of NODWIN Gaming said “Clash Royale was the obvious choice. It has a big, active and highly responsive community in India”. Prize pool worth Rs. 2.45 Lakhs. The tournament consists of 3 Starter Cups, 1 Challenger Cup and the Masters . Starter Cup winners and runner-ups will advance to the Challenger Cup along with a decent prize money. There will be 2 more Starter Cups i.e. Starter Cup 5 and Starter Cup 6. If you fail to hold a position in Starter Cup 4, you can always look forward for the upcoming two. The Indian Clash Royale community is huge and I have been a part of it since the game underwent its Soft Launch days. The community is overwhelmed with the inclusion of Clash Royale into ESL India Premiership. Well-known players like Slim Shady, m1ndfreak and Haseeb are proud to be participants of the first EIP Clash Royale Starter. The registrations will close today and matches will begin from tomorrow onward. You can still register for the Starter and compete against India’s best Challengers. Hurry up, don’t delay! Stay connected with Spiel Times for frequent updates regarding the Starter and additional news from behind the scenes. Facing problems with the registration? Consult with the ESL India team at Discord. Over 70 players have already registered and now it’s your turn! Keep in touch with Spiel Times for more gaming, technology and esports related information, news and stuff.